This San Antonio hotel features beautiful courtyard views, three outdoor pools, and two on-site restaurants. 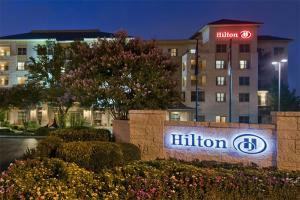 The hotel is a short drive from San Antonio’s International Airport, the River Walk, the Alamo and SeaWorld. Guest rooms and suites feature rustic décor, HDTVs, serenity beds and Wi-Fi. Unwind at the full-service spa offering a wide range of indulgent treatments. Located about 16 miles from the San Antonio International Airport.